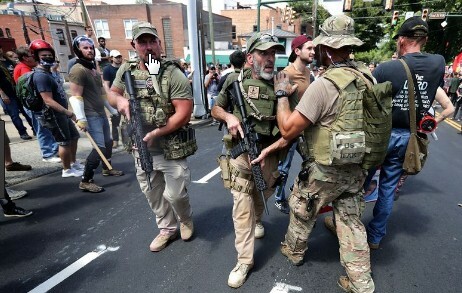 Charlottesville isn’t so much a turning point as a tipping point where a long standing social problem became a passionate social issue for the rest of us, as it should have been sooner. The media’s periodic stories of hate crimes and hate groups over the years just didn’t catch our attention. Back when this latest iteration of white supremacy started growing again during the 1980’s, it was financed by bank robberies and break-in’s with the proceeds being shared around the country with various other hate group chapters. The oxygen needed to organize and grow these hate groups is the same as for any other enterprise. It takes money… lots of it. So how much money does it take to sustain and operate this huge national, in fact global, white supremacy movement today? 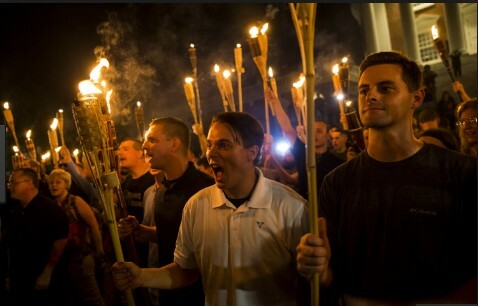 Who provided the cash to pay for all those tiki torches,the military equipment and the uniforms worn by so many alt-right protesters? Who provides the money to support the targeted alt-right media campaigns required to convert, recruit and motivate so many young white men? Who coordinated and subsidized the transportation needed to get everyone there and back, and where did the money come from to pay for it all? Who would want to harm our country and paralyze our politics so much that they would provide tens of millions of dollars to sustain this sick movement? I don’t have answers, but these are among the questions we should be asking. Since it is obvious the movement is being funded by bank robberies these days, and since it is a global movement with strong elements in Great Britain, Germany, France and Italy (to name a few), it is likely that funding for this movement is coming from wealthy sources that what to diminish or control Western democratic countries like ours. I suspect foreign sources are ultimately behind the growth of hate groups here and abroad. You might think I’m crazy, but if I’m correct, this is just another aspect of the new type of warfare raging against us.Power and control are behind this movement. The haters themselves are only brainwashed pawns in a much larger game. Does it seem like supporters of Donald Trump are out of touch with reality? Why are they so dismissive of claims that Russia attacked us? Even in the face of truly damning information about how the Donald Trump Jr. colluded with Russian’s to get dirt on Hillary Clinton, the far right and their Representatives in Congress seem unmoved. Why? Map of cyber activity by Right-wing websites during the 2016 election to counter mainstream media advantage. 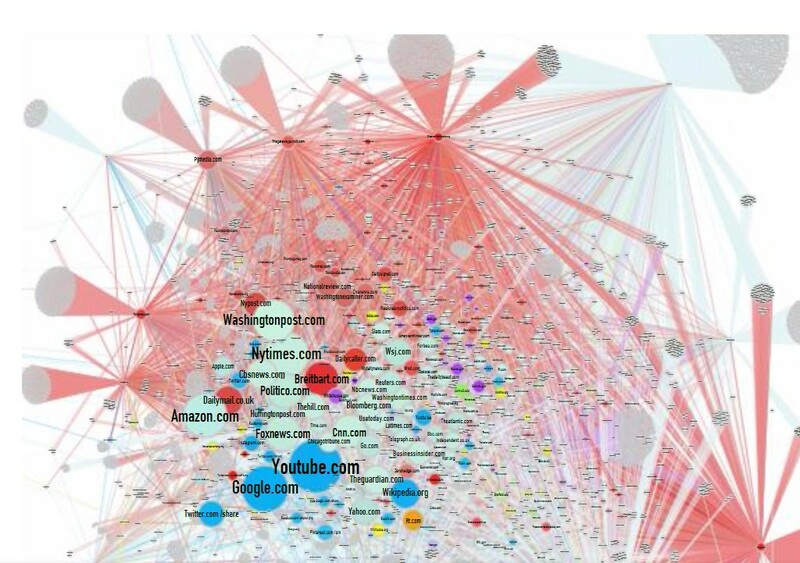 Recognizing that computer algorithms currently use by social media keep me from viewing the conversations of those who don’t share my views, I began reading conservative websites such as Breitbart and Info Wars for clues. I forced myself to listened to broadcasts of the Alex Jones Radio Show on Info Wars. For those who don’t know him, Alex Jones is a popular right-wing talk show host. He has millions of listeners and claims those numbers are growing as Fox News numbers decline. He is also the manager or owner of a number of conservative media outlets. You probably are familiar with Breitbart. It was initially financed by recluse billionaire, Robert Mercer. Steve Bannon was the man in charge there until after this past last election. As I browsed through these websites, one particular radio show caught my attention. I listened in detail (took notes) to a radio broadcast of Alex Jones on July 12, 2017 (http://rss.infowars.com/20170712_Wed_Alex.mp3). Using this as a starting point, and having sampled other content on both Breitbart and Infor Wars, some patterns emerged that I want to share. First, the verbiage of Alex Jones’ show can’t be easily unpacked. It is dense with disinformation, oblique references, inflammatory innuendos and repetitive conservative and nativist memes. The overall narrative establishes and affirms an alternative frame of reference for his conservative listeners. The broadcasts contain a blitz of buzz words and references to long debunked Obama era scandals, as I would characterize them, woven into a story line that alters the context of current events. The content is clearly intended to evoke elicit emotions in the listener. But the biggest insight was that these conservative sites ring exactly the same alarm bells about democracy under attack and a pending authoritarian takeover that those on the left worry about. Info Wars also points to the same means and methods used to attack America as do the rest of us do, such as media disinformation and internet propaganda. But these conservative websites substitute Islamic jihadists for Russian oligarchs, and they substitute “Marxist” liberals for rightwing nationalists. In effect, this counter narrative creates two American world views that are mirror images. It unites us in our worst fears for American democracy while irreconcilably dividing us politically. We agree that we are at war conducted through information warfare, but we have different enemies waging this war and different ideas on what are foreign enemies trying to accomplish. We can’t come to any mutual understanding because we have an entirely different framework and different sets of facts. That enemy is radical Islam. Guandolo’s website promotes the view that the real threats to America originates from Middle East terrorist organizations. The site has been active since June of 2012 and appears to be hosted in Montreal, Canada, according to its domain registration data. On the other side, Rachael Maddow had Michael Carpenter on her show recently. He was a U.S. Deputy Assistant Director of Defense before retirement. His take on our strategic threats places Russia at the center of the attacks on our democracy. From what he saw in the past, the cyber operations during the last election are consistent with what Russia has employed in places like the Ukraine. Typically, Russia seeks proxies and allies in the foreign countries they attack to help carry out their cyber operations. They try to penetrate the networks of insurgent political groups seeking power within a foreign county. They do this, and help support those groups, to have influence as those groups gain power. He has no doubt that this has included infiltrating far rightwing groups in America and, by extension, the GOP. For Alex Jones, his constellation of media outlets continue to create and maintaining this alternative world view focused on terrorists as the existential to America democracy. Those how believe this are convinced the investigations of the Trump Administration are witch hunts and that the allegations of Russian interference are smokescreens by the “deep state” to conceal a leftist takeover of America. They point to their universe of alternate facts, theories and political conspiracies to prove there is an unholy alliance between the liberal elites and Islamist Jihadists seeking to impose Sharia Law on America. They deny the DNC was hacked by Russia, claiming there is no evidence. They see the accusation itself is proof of “deep state” preparations for a coup against Donald Trump. Even more moderate Republicans are held in suspicion. One commenter on Alex Jones’ show said, “The GOP establishment hates Trump more than MSNBC.” In other words, the Republican establishment is complicit with the liberal elites in working with Hamas and other Islamic groups to bring about an authoritarian state and Sharia Law in America. The CIA, NSA and FBI are all in on it and can’t be trusted. Alex Jones defines Sharia Law as total warfare against our culture, social institutions, political systems, military systems, our media and our American way of life. According to Jones, these jihadists are experts in political influence operations. Note that this is just what our Intelligence community is saying about Russia. These are the alt-right media voices that conservative GOP members in the House and Senate are hearing . These are the sentiments reflected in their core constituents, their power base. Is it any wonder they hardly react to the US Intelligence community’s warning about Russia? The men and women of the GOP are just as patriotic as any of us, but they are straddling two very different world views. They have to know that both worlds can’t be true. Either the Russians are undermining our democracy in league with ultra conservatives oligarchs to divided America, or it is the Islamic extremists doing the same thing in league with liberal Democrats and the deep state (i.e., our Intelligence community). Since even the most conservative GOP members aren’t ranting in the halls of Congress about jihadists destroying American democracy, I assume they know which scenario is more likely. They also know how to stay in power. Even if a Republican lawmaker doesn’t share their constituents world, they can’t challenge their base without losing their seat. The GOP is, in fact, compromised. I said earlier that the content of Alex Jones’ show is densely packed with disinformation. In fairness, his listeners have no problem understanding his messages. If they were to watch Chris Hayes or Rachael Maddow, they would have the same critique as me of his show. We really do have two different perceptual realities. The forces creating this schism have to be well organized, well funded and very entrenched to pull this off. It’s time to uncover everyone involved in the media warfare that is tearing us apart. It’s time to fight back, reunite and restore civil democracy in America.